Why Is Being Customer-Driven Important? Why Is Being Market-Driven Important? Is There Value in Being Both Customer and Market-Driven? What is a Customer- and Market-Driven Organization? Explain Drucker’s guiding ideas on the customer and the business. Explain what it means to be a customer-driven organization. Explain what it means to be a market-driven organization. Utilize tools and techniques for assessing and enhancing your company’s customer- and market-driven performance. In this module we start by exploring why it’s important for organizations to be customer- and market-driven, and examine the three essential activities management teams focus on to make it happen. We then take a look at how admins and Salesforce can help! Let’s jump right in! It is hard to find an organization that does not talk about being customer-driven. When a company stresses this idea, it is signaling to the organization to listen more deeply to customers, share this information broadly within the company, and to deliver solutions that almost sell themselves. Companies like Amazon, Zappos, and Nordstrom immediately come to mind as companies known to be customer-driven. The question is not whether organizations should be customer-driven; of course they should. The question becomes what are the best practices, and what are the benefits? That is, how does one take wanting to be customer-driven, and turn that into action? In other words, the customer decides what’s valuable and worth paying for, not the business. By focusing on delivering solutions that help customers be successful, business results follow (see Figure 1). This simple principle is critical to business success. Let’s take a quick look at how this plays out in everyday life. An easy place to look is the fast food industry. Take KFC’s long gone “Nacho Box”—it looked enticing in the marketing images, but what the customers received was quite different. Unhappy customers shared their disappointment with others online, “It looks more like week-old garbage mixed with surgery leftovers!” As complaints mounted, it disappeared from the menu. Oops! A more serious example is the United Airlines merger with Continental Airlines. Aggressively integrating the two companies without thinking through the customer impacts resulted in widespread service disruptions and stranded passengers. Upset customers bailed. When United felt it in their bottom-line profitability, their CEO issued an open letter to customers, stating: “Simply put, we haven’t lived up to your expectations or to the promise and potential of that day. That’s going to change. We are committed to re-earning your trust.” In the end, customers can keep even large companies humble! The power of the customer has risen dramatically in recent years—largely due to social media tools that make it easy and fun to share experiences and influence others—and do so on a scale never seen before. The rise of customer-generated content has had a profound impact on many industries. When was the last time you purchased a significant item without reading a review? Or perhaps you submitted one of the 300 million consumer reviews that TripAdvisor now hosts for travel destinations. Social media has made customer response immediate, visible, and effective. The link between online reputation and business performance is quite real. 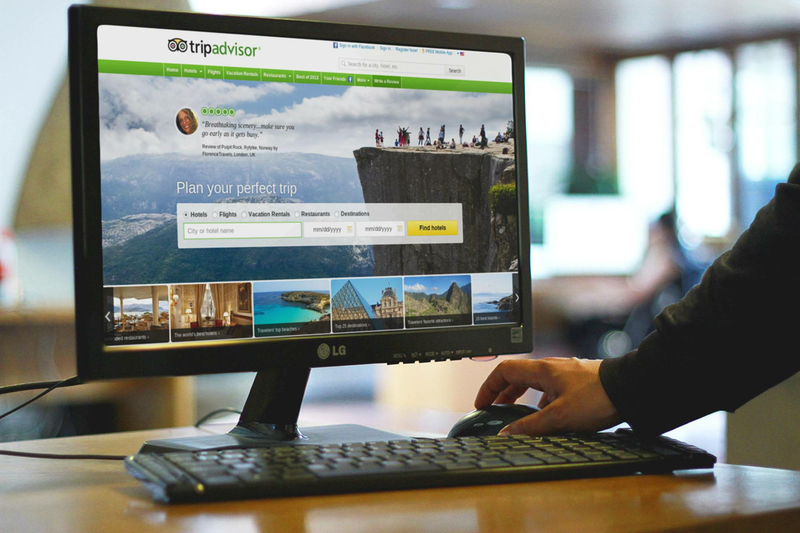 For example, a recent study of the hospitality industry by Cornell University found that for every 1% improvement in a hotel’s online reputation, its “RevPAR” (revenue per available room) improves by 1.4 percent. This works in reverse too—negative reviews can be like a punch in the gut. A reviewer on TripAdvisor wrote the following about their hotel stay, “Pretty sure I’m going to get a rash or disease due to sanitation conditions.” A few more bad reviews like that one, and the hotel is going to have a problem! For these reasons, it is essential to be customer-driven and responsive. Organizations need customers to fall in love with their products and services, and stay in love forever! Being customer-driven is essential, but in reality, it’s not enough—organizations also need to keep their eyes on the broader market. Companies have gone out of business by missing changes in market forces. These types of changes are difficult to predict by only focusing on your customer base—look outside the organization. Remember Nokia? Not that long ago, they were riding high as the one of the largest vendors of mobile phones on the planet, controlling over 40% of the global mobile market. They listened carefully to their existing customers about features, functions, and needs. They designed and built beautiful mobile phones. Unfortunately for Nokia, the market shifted significantly, and they never recovered. What happened? They did not grasp the market shifts in smart phone preferences (for example, touch screens), or the impact of the ecosystems built by competitors (for example, developer communities). As a result, they lost time while both Google and Apple flourished. Stephen Elop, Nokia's former CEO, wrote a famous memo to Nokia employees in which he likened their changing market situation to being on a burning oil platform. Nokia’s mobile phone business did not recover, and was eventually sold to Microsoft. If they had been more market focused, they might have had a chance; after all, they had 40% of the global market share! The point is this: market-driven companies have a strong external focus. They monitor competitors, as well as new emerging technologies, social changes, and regulatory policy. They generate market intelligence, analyze and disseminate this intelligence, and act accordingly. As a result, they can respond to changes quickly, and with some skill and practice, they can even predict and help shape market forces. Happier and more loyal employees (although not always). Netflix is a company that can attribute much of its success to being both customer- and market-focused. In its early days, it focused on existing customer needs (for low priced DVD and online videos), correctly predicting the demise of brick and mortar rental stores such as Blockbuster. Netflix is now driving subscription video on-demand (SVOD), and developing its own content with groundbreaking shows like “Orange is the New Black” and “House of Cards.” And, they are doing it by having some of the most employee-friendly policies in the industry, such as their innovative maternity and paternity leave policies. 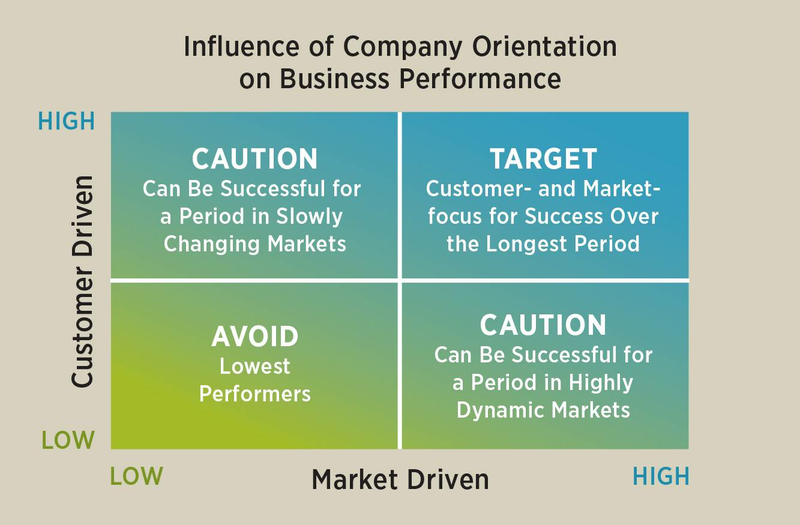 To sum up, it is important to recognize that companies can be successful in the short term by focusing on being either customer-driven or market-driven, but over the long term, companies are typically more successful when they focus on both (Figure 2). The upper right-hand quadrant is where you want to be! Drucker, P. F. (1954). The Practice of Management. Jaworski, B., Kohli, A. K., & Sahay, A. (2000). Market-driven versus driving markets. Journal of the Academy of Marketing Science, 28(1), 45-54. Slater, S. F., & Narver, J. C. (2000). The positive effect of a market orientation on business profitability: a balanced replication. Journal of Business Research, 48(1), 69-73. Vargo, Stephen L., and Robert F. Lusch. "Evolving to a new dominant logic for marketing." Journal of Marketing 68, no. 1 (2004): 1-17. Berthon, P., Hulbert, J. M., & Pitt, L. F. (1999). To serve or create? Strategic orientations toward customers and innovation. California Management Review, 42(1), 37-58.